The Finn Whale is the second largest animal on the planet after the Blue Whale and inhabit all the oceans of the world. The second largest living animal on the planet, the Fin Whale is found in all the oceans of the world, although their numbers have been severely effected by commercial whaling. 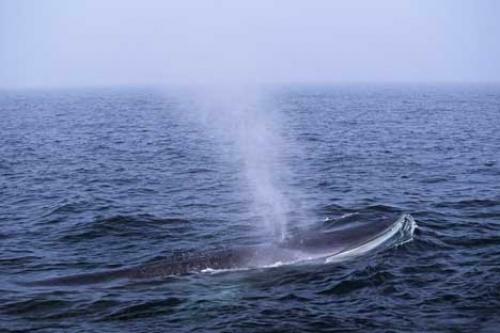 The Fin Whale is sometimes refered to as Razor Back whales because of a sharp ridge running down their back from the dorsal fin. I photographed this Fin Whale, which also goes by the scientific name Balaenoptera physalus on the Saint Lawrence River in Quebec, Canada. Photo of a large Fin Whale in St. Lawrence River, Quebec, Canada. Pictures from photo gallery "Whale Pictures"
This picture is part of the photo album "Whale Pictures" - there are more beautiful images waiting for you.